For many new iPad users, Apple's magical and revolutionary device acts as a laptop and sometimes even a desktop replacement. Many iPad users just need to check email and surf the net and a traditional laptop or desktop is overkill. For these users, the key features of the iPad are its long battery life and its simplicity, rather than its portability. These people are most likely the target market of the iCapsule. This integrated Bluetooth keyboard and case copies the original design of the first iBook so much that more than one person asked why I was carrying a black iBook. If they ever make this in blue or orange, there will be many confused people out there. 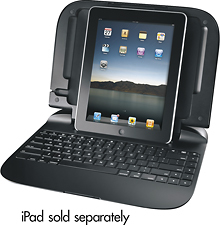 When the iPad is placed in this case, it looks like the typical laptop: screen on top and keyboard on the bottom. Close the iCapsule just like you would a clamshell style laptop (though the iPad won't go to sleep when you close it) You'll notice there isn't a pointing device or trackpad on this "laptop", which got annoying after a while. I was so used to typing on it like a laptop I'd instinctively move my thumbs towards the trackpad rather than the screen. That's a testament to how seamless the transition from the iPad experience was. The actual case provides no padding, but has a handle and is made of hard plastic so mishaps are less likely. The screen is somewhat protected from impact when closed because it is flush with the keyboard. Occasionally debris from the keyboard was transferred to the iPad screen when the case was closed (incidentally, this is a common problem with traditional laptops). While the iCapsule had your typical keys including control, option and escape, it replaced the typical function keys with a variety of handy quick keys such as full volume and music controls (pause, play etc) as well as selection, copy, spotlight and keyboard toggling. This is very handy for someone doing serious work on an iPad. iPad purists will balk at the amount of bulk this adds to the iPad and that it somehow defeats its purpose. Partially they are right. Many people replace their laptop with an iPad because they want a lightweight powerful alternative with incredible battery life. Of course, serious typing is near impossible on the iPad. Typing on the iCapsule was quick and responsive. The device takes two AA batteries, but the keyboard goes to sleep after non-use. Unfortunately the iCapsule suffers a near fatal flaw that I hope gets fixed in later releases. While the designers left space to plug in headphones on the side, they failed to include a port for the 30 pin connector. The only way to charge your iPad is to remove it from the iCapsule. Over time it becomes a pain to constantly remove your iPad in order to charge it. Because the keyboard is bluetooth, you'll be reducing your battery life significantly and thus charging is more important. Moreover, the sleep button was difficult to access while in this case. The designers left little room for it. If you put the iPad in backwards (which you can do), the iPad will constantly go to sleep due to the pressure. Accommodations should have been made to make sure that all ports were available and you couldn't put the iPad in its case backwards. This article used with permission by the Lawrence Apple Users' Group. The original article written by David Greenbaum aka DoctorDave™ or incorrectly Dr. Dave can be found here. GigaOM: A Paperless Mobile Office: Just a Dream?